Furthermore, globalization has contributed to the steady decline of overall income inequality between countries over the past 20 years. This has been a significant achievement and has helped lift hundreds of millions of people out of poverty. Within countries, however, income inequality has actually increased, on average.10 Restrictions on immigration, trade and other cross-border flows are on the rise after a quarter-century of rapid globalization.11 Growing levels of nationalism, protectionism and parochialism, coupled with developed countries seeking to reindustrialize or upgrade their manufacturing sectors raises questions around reshoring. Therefore, the Fourth Industrial Revolution could potentially coincide with a slowdown or even reversal of international collaboration. These factors, combined with the speed and scope of technological change, add a layer of complexity to the already challenging task of developing and implementing industrial strategies that promote productivity and inclusive growth. Developing countries with a primary competitive advantage of low-cost labour face serious risks, as emerging technologies could lead to reshoring manufacturing back to high-income countries and limit the production opportunities for lower-income countries. Developed countries seeking to reinvigorate their manufacturing sector also need to grapple with the reality that the same blue-collar jobs of past years may never return. The future of production is at the heart of the Fourth Industrial Revolution and presents a myriad of opportunities. Despite the challenges inherent in any transformation of any industry, it has the potential to lead to unprecedented gains in productivity, efficiency and quality. The adoption of technologies on a global scale can dramatically increase the connectedness of global value chains and unlock new data-driven business models. Furthermore, combining emerging technology with human skills can boost productivity and reduce error rates, while creating new types of jobs and increasing demand for higher skill labour. The Fourth Industrial Revolution also has the potential to create entirely new product portfolios as technologies increase flexibility and enable customization. For production-specific use cases of emerging technologies, readers should refer to the World Economic Forum white paper Scaling Fourth Industrial Revolution Technologies in Production: The New Economic Growth Engine, scheduled for publication in early 2018. Leapfrogging opportunities may also emerge in areas where new technological paradigms reveal clusters of new industries and opportunities to realize gains in competitiveness, as discussed in more detail in Box 1.1. Schumpeterian economists first proposed the term ‘leapfrogging’ together with the concept of the ‘windows of opportunity.’ Perez and Soete proposed that emerging technological paradigms serve as a window of opportunity for the latecomer or developing country that is not locked into the old technological system to grab new opportunities in the emerging or new industries.12 They further pointed out that during the time of paradigm shift, certain advantages of early entry into these new industries exist, such as low entry barriers and a lack of firmly established market leaders. During the initial stage of any new technological paradigm, the technology performance is unstable. Therefore, if human resources are able to access the sources of knowledge and create new additional knowledge, entry into emerging technology could be easier than during the later stage of technological evolution. Furthermore, latecomer countries can be said to hold a relatively advantageous position, as they are not locked into existing technologies. In contrast, advanced countries tend to fall into the incumbent trap. They are often locked into current existing technologies due to currently high productivity within those technologies, but remain unsure about the profitability of emerging technologies. Even if one country or a single company within a country takes the option of leapfrogging, it should be carefully managed because it comes with both possibilities and risks.14 These risks tend to fall into two categories: 1) making the right or wrong choice among several alternative technological trajectories and standards, and 2) uncertainty as to whether an initial market for the first movers exists. No opportunity comes without risks, and the Fourth Industrial Revolution is no exception. New business models could quickly alter the attractiveness of manufacturing locations, leading to a high concentration of global manufacturing activity in a small set of countries and companies and shocking countries where manufacturing activity significantly drops. ‘Double winners’ or ‘double losers’ of globalization and the Fourth Industrial Revolution could result in increased inequality and social unrest. Automation has already led to job loss, and technology could increasingly become a substitute rather than a complement to human productivity. Hoarding of technologies could limit the extent of adoption and diffusion. Conversely, widespread adoption of emerging technologies into high-stakes production environments could have adverse impacts if there are system failures, such as artificial intelligence making costly production related errors in judgement. These risks need to be anticipated, monitored and mitigated. One of the key defining features of the Fourth Industrial Revolution is uncertainty. Innovation can be hugely disruptive, but the extent of the disruption that will occur or which sectors will be most disrupted, while currently debated and forecasted, is still unknown and can be shaped by countries today. The share of traditional manufacturing compared to advanced manufacturing will shift over time, but to what extent and how rapidly? The Fourth Industrial Revolution will fundamentally transform production systems, but at this nascent stage its full impact has yet to be realized. That is why, as production systems stand on the brink of another technological revolution, countries need to decide how to best respond. Countries at different stages of development can learn from global approaches as they shape their own unique journey in the future of production. However, there is no one-size-fits-all approach for the future, and countries will need to intentionally choose to be different and make trade-offs as they form and execute their strategy. Not all countries may prioritize advanced manufacturing as part of their strategy, as some may seek to pursue traditional manufacturing and capture share within current production paradigms in the short term. Countries will also need to decide on the sectors and value chains within production to prioritize based on comparable advantages. Most importantly, countries need to make decisions about production in the context of their national economic strategy. A combination of multiple strategies around production, services and agriculture is likely needed to drive growth, prosperity and innovation in the future. As in all industrial revolutions, input from all stakeholders is required for successful transformation. Governments, companies, trade unions, academia, civil society and others should collaborate to shape the future of production. Public-private collaboration is particularly critical to facilitate participation in future global value chains. New approaches to public-private collaboration to complement traditional models can also help governments effectively partner with industry to unlock new value for the country. Preparation today can help countries be agile, competitive and resilient in the future. Put more specifically, ‘readiness’ represents the extent to which a country has capacity and is well positioned today to do the following in the future: 1) capitalize on advanced manufacturing opportunities, 2) mitigate risks and challenges, and 3) be resilient to future shocks and the unknown. To enhance readiness and prepare for the future, decision-makers need to assess their current capabilities, identify new capabilities required to benefit from and succeed in a new production paradigm, and develop collaborative and customized solutions to facilitate transformation. The World Economic Forum Country Readiness project has launched a new diagnostic tool, benchmarking framework and data set to build awareness on the key levers and factors required to transform production systems; help decision-makers assess the extent to which their country is ready and positioned to shape and benefit from the changing nature of production; and catalyse public-private sector dialogue and joint actions to transition to future realities. The Readiness for the Future of Production Assessment analyses the degree to which countries today are well positioned to shape and benefit from the changing nature of production in the future. The findings presented in this report are the result of the Readiness for the Future of Production Assessment 2018 that was carried out with this tool. The framework, methodology and data will continue to be refined as the future unfolds. The forward-looking assessment is based on two dimensions: Structure of Production, or the current baseline of production today, and Drivers of Production, or key enablers to capitalize on emerging technologies to transform production systems. Insights and findings from the assessment can inform the development of modern industrial strategies and supporting policies as countries seek to improve their production base and key enablers. Leaders can also use the tool to track progress and monitor results over time. With the release of the Readiness for the Future of Production Assessment 2018, it is important to draw boundaries on what the tool does and does not do. 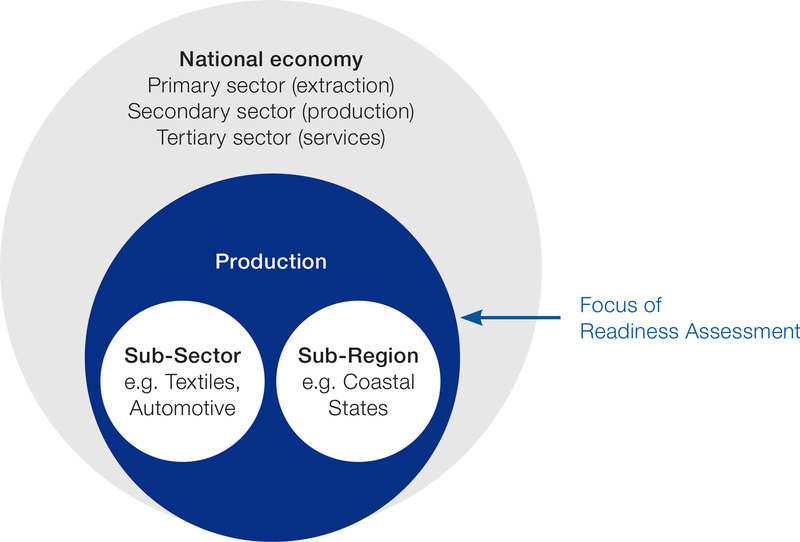 Since the assessment is designed to be a mid-level analysis focused on production, it does not look at overall national economic strategy across sectors, nor does it look at specific sub-sectors within production. The tool does not differentiate between sub-regions within a country, but measures average overall readiness. Figure 1.1 identifies the focus of the assessment within this broader context. Rather than current performance, it measures readiness for the future of production where a confluence of technology and trends will reshape the way things are made. Given that the future is uncertain and inherently difficult to measure, the assessment is not a prediction of the future. By design, it does not provide an overall ranking of countries, recognizing that each country has its own unique development path and production objectives that a linear ranking would not sufficiently capture. Instead, countries are placed into one of four archetypes that provide a new dimension for benchmarking against countries in a similar position. Based on specific research questions, the assessment allows for any desired clusters within or across archetypes to be formed and analysed. Further, it is not prescriptive, but provides elements of analysis in the form of comparable and reliable indicators that must be further interpreted within the context of a given country to inform agenda-setting and decision-making. The assessment is one of many tools that decision-makers can use to prepare for the future and enhance readiness. Other ongoing projects under the mandate of the World Economic Forum System Initiative on Shaping the Future of Production provide deeper analysis on key enablers, including technology and innovation, employment and skills and sustainable production. In 2018 and beyond, the Country Readiness project will release additional tools to support treatment of the diagnostic (i.e. how countries address opportunities and challenges identified in the assessment), including a transition framework to help governments design new strategies in collaboration with the private sector, civil society and academia. 5 International Labour Organization (ILO), ILOStat database, “Employment by sector-ILO estimates by sector, May 2017”, http://www.ilo.org/ilostat/faces/oracle/webcenter/portalapp/pagehierarchy/Page3.jspx?MBI_ID=33&_afrLoop=17253709312153&_afrWindowMode=0&_afrWindowId=ski7n9msm_1#!%40%40%3F_afrWindowId%3Dski7n9msm_1%26_afrLoop%3D17253709312153%26MBI_ID%3D33%26_afrWindowMode%3D0%26_adf.ctrl-state%3Dski7n9msm_45. 6 Manufacturers Alliance for Productivity and Innovation (MAPI), How Important is U.S. Manufacturing Today, 2016, https://www.mapi.net/forecasts-data/how-important-us-manufacturing-today (Manufacturers Alliance for Productivity and Innovation (MAPI)). 7 Organisation for Economic Co-Operation and Development (OECD), Research and Development Statistics (RDS) 2017 database, http://www.oecd.org/innovation/inno/researchanddevelopmentstatisticsrds.htm. 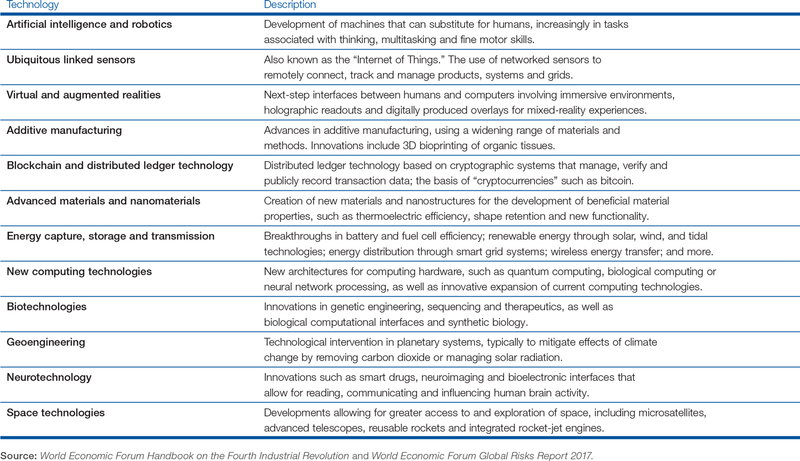 8 Schwab, Klaus, The Fourth Industrial Revolution: what it means, how to respond, World Economic Forum, 2016, https://www.weforum.org/agenda/2016/01/the-fourth-industrial-revolution-what-it-means-and-how-to-respond/. 9 World Bank, Trouble in the Making? The Future of Manufacturing-Led Development, 2017, http://www.worldbank.org/en/topic/competitiveness/publication/trouble-in-the-making-the-future-of-manufacturing-led-development. 10 World Economic Forum, The Global Risks Report 2017 12th Edition, 2017, http://www3.weforum.org/docs/GRR17_Report_web.pdf. 11 Peterson, Erik R.; Paul A. Laudicina, and Rudolph Lohmeyer, The Centrality of Governance: Global Trends 2017–2022, Global Business Policy Council (GBPC)Global Business Policy Council (GBPC)/Research Report, AT Kearney, 2017, https://www.atkearney.com/web/global-business-policy-council/the-centrality-of-governance. 12 Perez, Carlota and Luc Soete, “Catching-up in technology: entry barriers and windows of opportunity”, in Technical Change and Economic Theory, edited by G. Dosi, C. Freeman, R. Nelson, G. Silverberg and L. Soete, 458-479, Pinter Publishers, 1988. 13 World Bank, Exploring the Middle-Income-Trap, East Asia Pacific Economic Update: Robust Recovery, Rising Risks, vol. 2. Washington, DC, 2010. 14 Lee, Keun, Schumpeterian Analysis of Economic Catch-up: Knowledge, Path-creation, and the Middle-income Trap, Cambridge University Press, 2013.